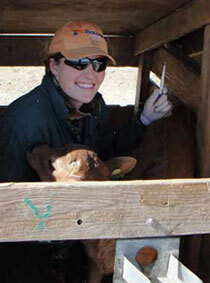 Student Elisha Adkins doing research on Holstein serum protein in Jersey calves. Adkins and fellow students Kim Noyes and Justin Ward, wrote an abstract about their research that earned them a place in this year's AABP national student competition. The 2011 AABP conference integrated dairy and beef medicine, as well as small ruminant medicine in parallel sessions held by the AASRP (American Association of Small Ruminant Practitioners). It also offered a full day of leadership exercises and group discussions. On the faculty side, Dr. Villarroel presented a poster on “Paste Dehorning Young Calves.” The poster, printed and laminated courtesy of Dr. H. W. Naylor Co., Inc. (one of the manufacturers of dehorning paste), is available in English and Spanish through the Extension Service at OSU. Dr. Villarroel is the chair of the Information Management Committee of the AABP, one of 17 committees that embrace all aspects of bovine medicine needs. You can find more information on the AABP website. 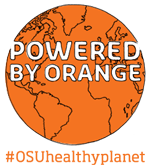 Next year’s conference is in Montreal, Canada, September 20-22, 2012. Dr. Villaroel encourages the Class of 2015 to join the student chapter of the AABP by December 31, 2011 in order to get their membership dues waived.